In order to regain his swamp, an ogre travels along with an annoying donkey to bring a princess to a scheming lord who wishes himself King. Back in 2001, Shrek became something of a surprise smash. It went onto to do very well at the box office and it spawned multiple hit sequels. Because this represents my fourth review of Shrek, I’ll skip the usual movie discussion. If you’d like to see my full thoughts, please click here. To summarize, I felt unenthusiastic about Shrek in 2001 and I feel unenthusiastic about Shrek in 2018. While the movie shows promise and occasionally entertains, it never quite connects for me. 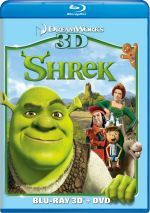 Shrek appears in an aspect ratio of approximately 1.85:1 on this 3D Blu-ray Disc. Shrek provided a positive visual experience. Sharpness seemed solid. A few shots came across as a bit soft, but these didn’t cause notable concerns, so overall definition appeared very good. No signs of jagged edges, moiré effects or edge haoles appeared. The movie also was totally free of any source flaws. The fairytale setting of Shrek offered a nicely bright and varied palette, and the disc reproduced the colors well. From the cartoonier tones to more natural and lifelike hues, the colors always came across as vivid and lively. Black levels also seemed deep and rich, while shadow detail looked appropriately heavy but not overly dense. In the end, Shrek provided an appealing visual presentation. As for the 3D imaging, Shrek didn’t go wild with stereo effects. While it offered a generally good sense of depth, it lacked a lot of standout 3D moments. Still, a few shots – mainly with aerial components – brought out some moderate “pop-out” elements, and the sense of environment came across well. This wasn’t a great 3D presentation, but the visuals added some impact to the film. Only one extra appears on the Blu-ray disc: a 3D trailer for Puss in Boots. The set included no 2D Blu-ray version of Shrek. The package does provide a DVD copy of Shrek, though, and it comes with some extras. First up is an audio commentary from producer Aron Warner and directors Vicky Jenson and Andrew Adamson. All three were recorded together for this running, screen-specific piece. Overall, I like the track, though it can be fairly erratic. Three Deleted Scenes run a total of eight minutes, three seconds. We see “Fiona’s Prologue” (2:55), “The Deal” (2:41), and “Fiona Gets Them Lost” (2:27). These come to us as “storyboard pitches”; this means we see storyboards while an animator voice-acts them for us. Two featurettes appear. Spotlight on Donkey runs 11 minutes, 36 seconds and delivers comments from Warner, Adamson, Jenson, Katzenberg, Myers, Murphy, Bielenberg, director Mike Mitchell, producer Teresa Cheng, and actors Antonio Banderas, and Walt Dohrn. “Spotlight” looks at the character’s development and design as well as Murphys’s casting and performance. The program gives us a decent but somewhat fluffy look at Donkey. Next comes Secrets of Shrek, a three-minute, 50-second piece. It identifies cameos and movie details that otherwise might go unnoticed. It’s a fun little bonus. “Shrek, Rattle & Roll” adds two music videos. We find “I’m a Believer” from Smash Mouth and “Best Years Of Our Lives” from Baha Men. The first one combines a lip-synch performance by the band with a minor plot in which lead singer Steve Harwell pursues his dream girl. Shrek clips are integrated in a clever and smooth manner, and it’s a decent little video with a funny ending. “Rattle” ends with “Karaoke Swamp Party”. This two-minute, 52-second reel shows the Shrek characters as they belt out some pop songs. It becomes a fun addition. The disc opens with ads for Megamind and Kung Fu Panda 2. These also appear under Previews along with clips for The Penguins of Madagascar, the Kung Fu Panda World game, and Shrek: The Musical. No trailer for Shrek shows up here. After a few viewings of Shrek, I still can’t understand the fuss the film received. While it has some reasonably clever moments, I feel it seems lackluster. 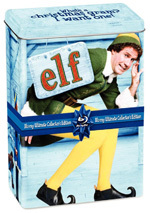 The Blu-ray provides excellent visuals, generally good audio and a small but informative set of supplements. This remains a mildly fun movie and a mildly effective 3D presentation.